LordsArt offers inspirational Christian art at great prices! Christian framed art by Ron DiCianni, Nathan Greene, David Bowman, Stephen S. Sawyer, William Hallmark and other Christian artists. Framed Christian art and unframed Christian art featuring biblical themes, scripture, pictures of Jesus Christ and more. What a great way to share your Faith and glorify the Lord Jesus Christ by displaying the beautiful artwork you purchased at Lordsart.com! We also offer a wide variety of Christian gifts, sculptures, apparel, tableware, stained glass art and more. We are a Christian business with Christian values and standards. We believe that everything we do should glorify our Lord and Savior Jesus Christ. We are here to serve you, our customers so that you can be blessed by the beautiful Christian art, gifts and jewelry we offer. 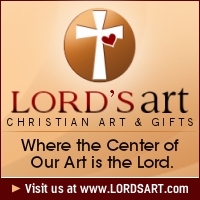 Make Lordsart.com your source for Christian art, Christian gifts and Christian jewelry and please come back again! Thank you for your business and may God richly bless you. Please refer to our FAQs on our Customer Service page before consulting us about a question, you may find your answer there. If we are on another line or away from the phone, please leave a message; and we will get back to you as soon as possible. We are in the Central Standard Time zone. We are authorized dealers of Christian artists, distributors and publishers and offer a variety of quality framed and unframed Christian art. We ensure the quality and authenticity of every piece of art we sell and guarantee the safe arrival and excellent condition of all artwork sold. All of our framed products are handcrafted. The molding is cut in a frame shop for each piece. Then the mat board is cut to fit the design. Then the glass is cut. Once the components are pulled together our custom framers assemble the framed art. Giving you a handcrafted custom designed high quality piece of framed art you can hang in your home and admire for generations to come. Most pieces ship out of the warehouse within 3-4 business days, some go out even sooner. Please allow up to several weeks during busy holiday periods. In the event that an item becomes unavailable or is on back order, we will inform you and give you the option of waiting or receiving a refund or credit. Lordsart.com offers high quality Christian art at great prices and excellent customer service. We are a Christian business with Godly values and standards. We strive to glorify the Lord by offering products that will be a blessing to others. We want all of our customers to be satisfied and to come back again! All of the art, products, text and images featured on this website are protected under domestic and/or international copyrights and the usage of these items and images are prohibited unless permission is granted by the artist or author in writing. Please e-mail your comments regarding our products to us! "Thanks for everything Lord's Art, I love my two new Ron DiCianni pieces, my collection keeps growing!" David S.
We offer a variety of Christian art prints, posters, giclees and artist's proofs, both framed and unframed Christian art. Share your Faith and glorify the Lord Jesus Christ by displaying the beautiful Christian artwork you purchase at Lordsart.com! "The earth is the Lord's and all its fullness..."
Please sign our Guestbook below, and come back again! Buy Christian Art at LordsArt.com!